Below are some links to Noonbarra Kelpies sold to customers in the United States and Canada. Some of these are bought for cattle or sheepwork, one was for Alpacas, others as first class companions and some for competitive Dog Sports such as Agility. The important thing is these people wanted a high quality, well breed Kelpie and chose our Noonbarra Stud in Australia despite the high cost of importing a dog to their country. In some areas of the U.S.A. we have quite a few Noonbarra Kelpies, such as California and Maryland but in other areas we have none. We now have Kelpies in the U.S. States of California, Oregon, Michigan, Alabama, Arkansas, Virginia, Oklahoma, Missouri, Illinois, Rhode Island, Maryland, Washington State, North Dakota, and Texas. 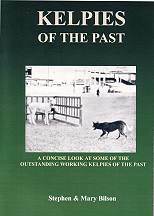 A great little book written by us on well known Kelpies from the past. From Gleeson's Kelpie and Brutus and Jenny right through to the Kelpies of the 1960's. Plenty of old and rare photos.